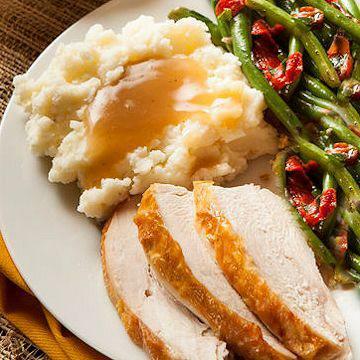 Thaw in Refrigerator.�Cold Entrees: Slice roasted turkey breast and serve.�Oven: Preheat oven to 350�F. Remove roasted turkey breast from packaging and place in baking dish. Cover with foil. Bake 40-50 minutes. Do Not Thaw!�MICROWAVE (1100-watt): Place tray in microwave, with film intact. Cook on HIGH for 5 minutes. Peel back film, stir and cook on HIGH for 1 minute. Carefully remove film. Stir and serve.�STOVE-TOP: Remove frozen tray of gravy into a sauce pan by flipping over tray and applying pressure to center of tray with thumbs, while holding the edges. Heat over medium heat for about 8-10 minutes, while stirring constantly. Heat until gravy starts to simmer. Ingredients:�Water, Green Beans, French Fried Onion (Palm Oil, Wheat Flour, Onions, Soy Flour, Salt, Dextrose), Mushrooms, Nonfat Dry Milk, Butter (Cream, Salt), Enriched Flour (Bleached Wheat Flour, Niacin, Reduced Iron, Thiamine Mononitrate, Riboflavin, Folic Acid), Modified Corn Starch, Dehydrated Onion, Salt, Chicken Base (Chicken Including Natural Chicken Juices, Salt, Chicken Fat, Sugar, Maltodextrin, Hydrolyzed Corn Gluten, Dried Whey, Natural Flavoring, Yeast Extract, Turmeric), Spices. Contains: Wheat, Milk, Soy.